I do love the Seasonal Shop - it's one of the festive highlights of Central Road and I challenge anyone not to to be transported back, for a moment at least, to their childhood at the sight of their Christmas display. 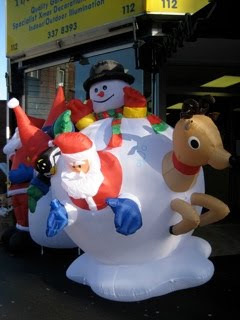 Blog reader Lizzie, however, was perplexed by this rather disturbing inflatable outside the smaller of the two Seasonal Shops - so much so that the took a snap of the offending item. I suspect that whoever designed this decoration intended it to be a giant snowball adorned with various festive characters. Instead they have created a demonic snow monster which is slowly ingesting some hapless Christmas creatures. Either that or they are emerging Alien-like from its frosty bowels. I can't decide which. "I took this picture and sent it to various friends and relations. The general consensus was ''weird, even by Worcester Park standards.' '' I thought it was just me. Probably eaten by something even bigger than an 7ft Father Christmas and reindeer-eating snowman. There was a half eaten penguin sticking out of its other side." I'm pleased to report that the scary inflatable is no longer outside the Seasonal Shop, so it is safe to take your children there without scarring them for life.